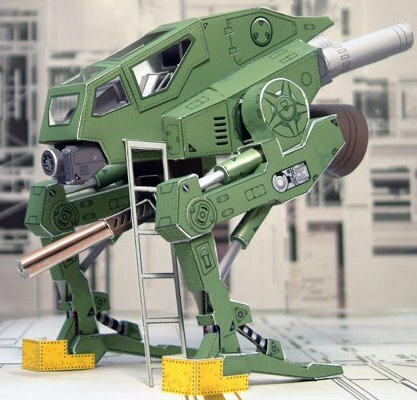 This papercraft mech was based on real life helicopter and tank designs. The Japanese website where this model is offered has very little information. It seems to be an original design, but it may be a vehicle from a movie. If anyone knows more, please let me know. The PDF template for the mech may be downloaded here. 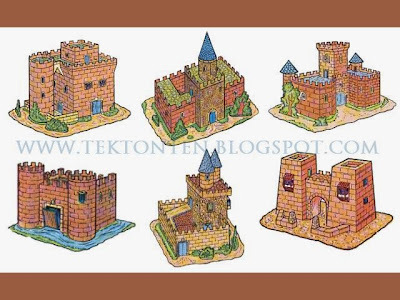 I love these six little vintage papercraft castles, but their origin is a mystery. The only clue to be found is that the templates for the castles list the publisher as "Edivas, Barcelona, Spain". There is no date to indicate how old they might be. From what information I was able to find, it appears that these six castles are part of a paper model series that includes at least nine models. Scans of the templates may be viewed here. There is lots of Dragon Ball Z papercraft around, but I think this particular paper model of young Goku has a sculptural quality that many of the other Dragon Ball models lack. 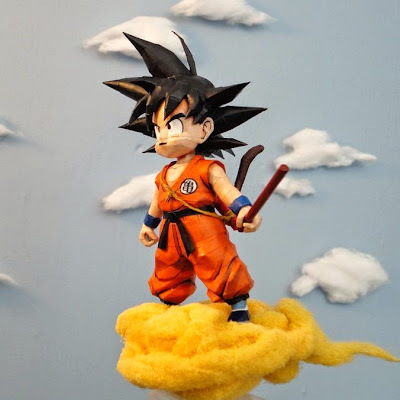 In the Dragon Ball Z anime, Goku is a member of the Saiyan race who are virtually identical to humans except for their monkey-like tails. The Pepakura PDO template for this model was created by Anderson316 and may be downloaded here. Sorry, there is no nimbus template available. :) Build photo by DeviantART member BRSpidey. 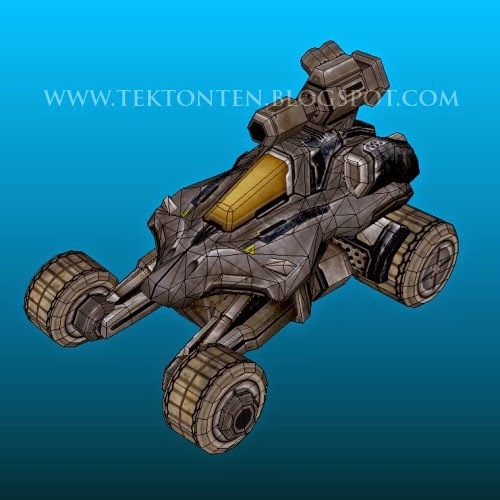 "...a high-speed raider built around a light weight four-wheel chassis. Hellions are capable of causing damage disproportionate to their size, particularly against enemy infantry, thanks to the heavy Internal Flame Throwers." This paper model was created by Dennis Griesheimer at the now defunct Gamepaper blog. The pepakura PDO template for the model may be downloaded here. 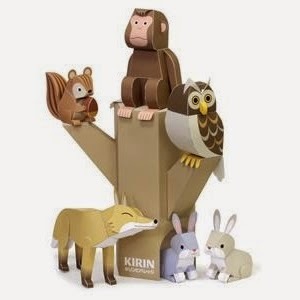 This cute papercraft diorama from the Kirin company features six animals: a squirrel, a chimp, an owl, two rabbits, and a fox. I think the fox is my favorite of the bunch. These "Forest Friends" are offered by Kirin as part of their collection of promotional paper toys for kids. Printable PDF templates for each of the creatures may be found here. A template for the "display tree" in the photo is also available. Here is yet another in Epson's Godzilla papercraft series. It's Mothra! 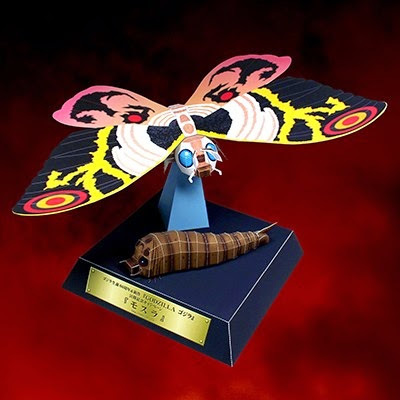 I like the fact the finished display includes both the larvae stage and the full grown Mothra. 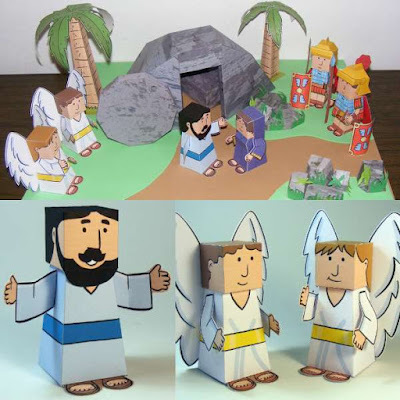 An PDF papercraft template for the model may be downloaded here. Along with Rodan and King Gidorah, Mothra is rumored to be a character in the Godzilla 2 movie scheduled for release in 2018. The majority of origami is folded from a single square of paper. 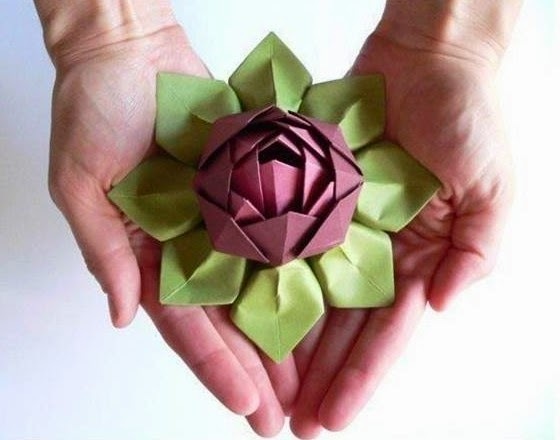 This origami lotus blossom might be considered "modular origami" as it is constructed from 12 pieces of pink paper and 4 pieces of green paper which are then folded together to form a single flower. Photos and video instructions for the blossom may be found here. In Asian religions, the lotus blossom is used as a symbol of purity. In ancient Egyptian culture, the lotus flower was associated with rebirth. A long standing enemy of the Avengers in comic books by Marvel, the super-villain Ultron has now been introduced into the Marvel cinematic universe as well. This life-size Ultron head by Gankutsu-o-Taku is one of the first contributions to the wave of papercraft fan art that is sure to follow the release of the Avengers: Age of Ultron movie last week. The Pepakura PDO template for the head is available here (after the jump, please read Taku's post carefully to get the password for the .RAR file). 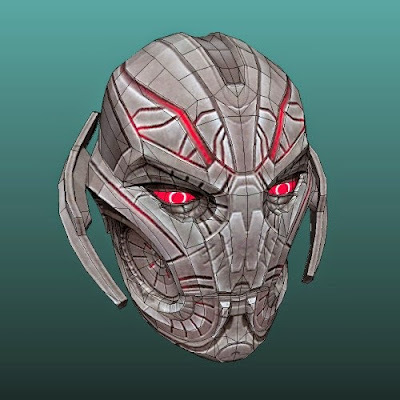 As this papercraft is life-size, theoretically it could be modified to become an Ultron mask!